← “Griffin Beak, Mermaid Fin, and Dragon Blood Stew” Is Now on the Secular Web! Yesterday I presented a conference paper at the 112th Annual Meeting of the Pacific Ancient and Modern Languages Association (PAMLA). 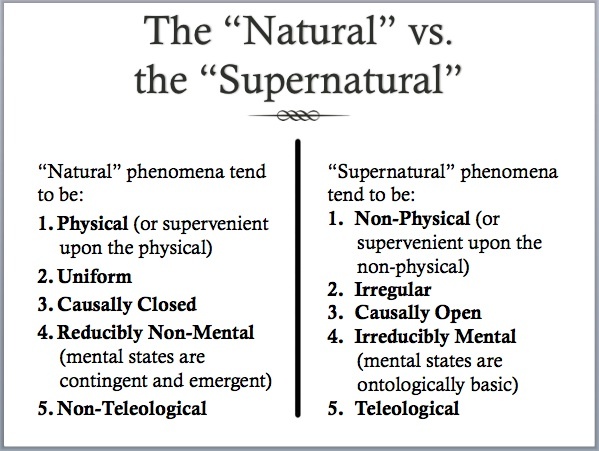 The conference theme for this year was “Familiar Spirits,” and I presented a paper titled “Philosophically Defining the Supernatural.” The topic relates to previous articles that I have written, both here in my blog series on metaphysical naturalism and in an earlier article here. You can read the full transcript of the paper that I presented here, which includes all of the images of my attending PowerPoint presentation. This entry was posted in Academic Conferences, Announcements, Philosophy and tagged Atheism, Defining the Natural, Defining the Supernatural, Metaphysics, Naturalism, Theism. Bookmark the permalink. – An oxygen atom has the potentiality to combine with two hydrogen atoms into a water molecule. – Water has the potentiality to freeze at 0° C.
– Glass has the potentiality to break. – An acorn has the potentiality to grow into an oak. II. Teleology pertaining to natural organisms. The paper that I have presented here and the earlier article you quoted are making the argument that agency-specific teleology (I) does not exist at the basic, reducible level in naturalism. There is no agency-specific teleology that guides our universe, and such agency-specific teleology (at the irreducible level) is characteristic of supernatural phenomena. This first, distinct understanding of teleology also relates to my 4th criterion of “irreducible mental” properties, since I am specifically referring to the sort of teleologies exhibited by minds and agents. This paper is arguing that there is no “high teleology,” as Carrier defines it, exhibited by natural phenomena (at least at the irreducible level), however, the teleology characteristic of natural selection is compatible with the “natural” as I have defined it here. As for the Teleological Argument for God Feser arrives at a conclusion different from Richard Carrier’s. Besides, if you accept the Aristotelian concept of teleology you depart from mainstream naturalism, as naturalism has to a large extent been antiteleological and anti-Aristotelian. An indication of this is the controversy over Thomas Nagel’s view concerning teleology in his book “Mind and Cosmos”. Yeah, I plan to interact more with both Feser and Nagel too as I continue research on this project. However, I don’t think that Ariew agrees with Nagel or Feser’s analysis, since Ariew argues that it is primarily Platonic teleology that is incompatible with naturalism. Thanks! With regard to humans or other animals, your conception entails – given that there are no souls – that they are natural. But what if there were souls? For example, let’s consider the counterfactual hypothesis that – as many theists believe – an omnimax (omnipotent, omniscient, morally perfect) irreducibly mental being (God) exists – so, naturalism is false, on your definition – and humans and other animals have souls (or are souls; there are different varieties) – immortal or not -, which are not reducible to any particles or non-mental stuff – God just creates those souls each time. In that scenario, are humans, cats and dogs supernatural, or more accurately partly supernatural, in a way similar to the way in which a witch would be supernatural? (I’m accepting dogs, etc., do have subjective experiences as well, and so souls in that scenario). P. S. I sent a longer reply to your post on Civitas Humana (two, actually, the second was a minor correction of the first) a few days ago, but it reads it’s awaiting moderation, so I thought I post a shorter reply here. Please let me know if you prefer that I post in only one of the blogs. I haven’t been checking the comments on Civitas Humana lately, partially because I have been catching up on blogging on this site, and partially because I have been really busy lately (I bought a new car this last weekend, for example). I do see now the two comments you submitted. I’ll answer your comments on Civ when I get the chance (probably in the next couple days). Sorry for the delay, but things are just a little crazy right now. Thank you, and no problem, of course, that’s understandable. Is there a way to provide a mechanism to supernatural explanations? Stuff like schmatons and supernatural organs that explain how the interactions between supernatural entities and the natural world occur. I have seen this problem once. The difficult part is, of course, give a reason for them to be supernatural, since all these mechanisms resemble natural mechanisms in one way or another.